LOOKING ahead to the 2014 centenary of the outbreak of the First World War, I started in November 2011 to compile a list of the fallen connected – born in, resident in or enlisted in – with the ThreeTowns of Ardrossan, Saltcoats and Stevenston and neighbouring Kilwinning and West Kilbride. I included those men who seemingly had no connection with the area other than enlisting there. Just as much as the locals who went off to fight for King and Country, they are, I believe, part of the area’s involvement in what ironically was called the war to end all wars. I used Soldiers Died in The Great War 1914-1919 (published by The Naval and Military Press Ltd), information available on the Commonwealth War Graves Commission website and The Ardrossan and Saltcoats Herald intimations database hosted by AyrshireRoots. From these, I drew up an alphabetical list of British-based enlisted men and non-commissioned officers who were killed or died from their wounds between 1914 and 1919, Royal Navy and merchant seamen who were lost, and a handful of officers from all services. The A&S Herald intimations and members and guests contributing to this website also provided the names of Commonwealth men and officers who had links to the Three Towns and surrounding area. I have since converted that alphabetical list – which is good in so much as it provides an insight into siblings and relatives who died – into a chronological one, which I believe gives a better overall view of the battles in which these men took part and the impact on the local area of, say, 30 deaths in one day. Not surprisingly, given the number of deaths they were dealing with, there are a few discrepancies between Soldiers Died and the CWGC. Where these occur, both are given on the list, which to date contains 894 names, compared with the 207 I had in 2011. It appears that a number of the names were taken phonetically and, while some can be guessed at, others proved more difficult to track down, such as John McGillivray of 11 Herald Street, Ardrossan, who appears in both Soldiers Died and on the CWGC as John McGilvery. 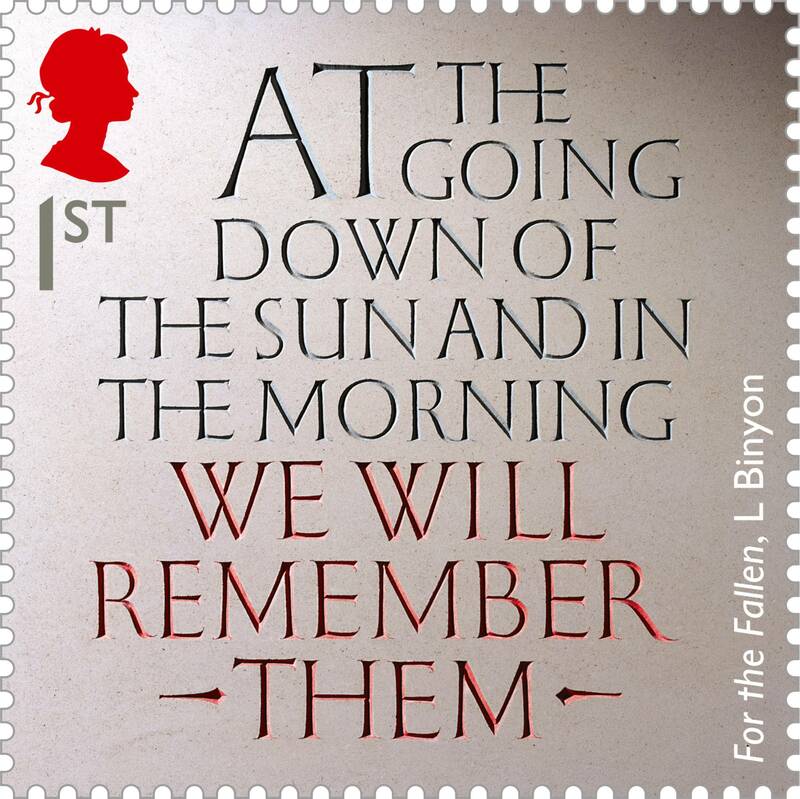 Using the three sources also enabled names – and not just initials – to be put beside most casualties, although many of the later casualties from 1919 onward have not been included in Soldiers Died and, to date, these remain with initials only. I had hoped headstones and memorials would fully identify these men and officers but, from a post on this website mentioning the World War One graves at West Kilbride cemetery, it would appear the same information appears on the headstones there as on the CWGC site. It should also be noted that not all of those who are given as died at sea are seamen, but also include members of the Royal Army Medical Corps and other regiments who perished when hospital ships and troopships were sunk. In my final tally, I have included 45 men whose names appear on local war memorials, but for whom no further details could be found. Of these 20 are on the Saltcoats memorial, 14 at Ardrossan and nine and two for Stevenston and Kilwinning, respectively. These will be posted separately in the hope that someone, somewhere will be able to help with the details. To date, I have found 294 memorials (not including local war memorials, but the “home” cemeteries of Ardrossan , Stevenston New Street , Kilwinning  and West Kilbride ) where men with links to the Three Towns, Kilwinning and West Kilbride are either commemorated or buried. The majority (187) contain one name, 55 have two names, 13 have three, seven have four, five have five, four have nine, three have seven, two have eight and two have six. The Ypres (Menin Gate) Memorial has 55, the Thiepval Memorial, to the missing of the Somme, has 53; the Arras Memorial has 39; and the Tyne Cot Memorial (to the missing of the Ypres Salient) has 38. The Helles Memorial (to those who fell in the Gallipoli campaign and whose graves are unknown or who were lost or buried at sea in Gallipoli waters) has 25. Le Touret Memorial (commemorating more than 13,400 British soldiers killed in that sector of the Western Front from the beginning of October 1914 to the eve of the Battle of Loos in late September 1915 and who have no known grave) has 21. Vis-en-Artois Memorial (to the more than 9,000 men who fell in the period from August 8, 1918 to the date of the Armistice in the Advance to Victory in Picardy and Artois, between the Somme and Loos, and who have no known grave) has 14, whereas there are 13 buried in the Jerusalem War Cemetery and 11 in Etaples Military Cemetery. The Basra Memorial (commemorating more than 40,500 members of the Commonwealth forces who died in Mesopotamia from autumn 1914 to the end of August 1921 and whose graves are not known) contains the name of 10 men with local links. The area’s seafarers are also remembered, with 23 names on the Tower Hill Memorial, which commemorates men and women of the Merchant Navy and Fishing fleets, and nine each on the Plymouth Naval Memorial and the Portsmouth Naval Memorial to those men and women who died at sea and have no known grave. Topic Stickied! Much appreciated, George. This will be a great research tool. Family researchers are welcome to ask in this topic for a look-up - give as much details as you can, please. I read with interest your post on local WW1 casualties. 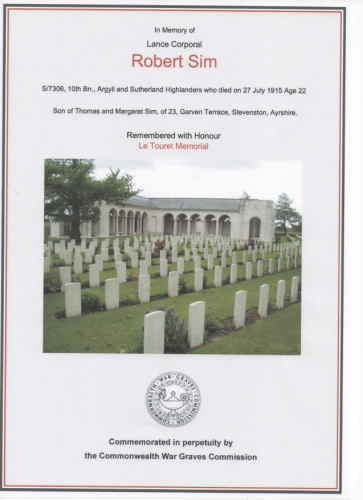 A soldier I researched who is listed on the Stevenston memorial is Sergeant Alan Dunsmore. His surname is misspelt on the memorial as Dunsmuir. He was from a Stevenston family who moved to London where he later joined the Dorsetshire regiment. He landed in Mesopotania (Iraq)from India with his Division and was wounded during one of the early battles in 1914 and was shipped back to India where he died from his wounds. 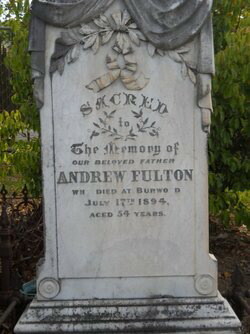 He is also commemorated on the memorial in Kirkee India but unfortunately the position of his grave has been lost. I checked the casualty lists in the Ardrossan & Saltcoats Herald without success as I would like to find any photographs that may exist. If any family descendants of Alan Dunsmore read this they may be able to help. I checked the casualty lists in the Ardrossan & Saltcoats Herald without success as I would like to find any photographs that may exist. I'm maybe misunderstanding you but there are a number of Ardrossan and Saltcoats Herald intimations through 1914/1915/1916 re an Allan Dunsmore, intimating his death at Station Hotel, Bombay - grandson of David McAllister of Stevenston - sister of Mrs P Angus, 5 Victoria Road, Saltcoats - brother of David - and nephew of Agnes. A military man before the war . That war was so devastating for folk. The papers would report great advances and that the Hun was on the run. Yet when the telegrams starting to arrive people found out it was lies. I remember the grief my grannie felt for her brother, blown to bits in the first line of trenches. No body, no grave never to be seen again just a fond memory. His name is inscribed on the Stevenston war memorial, William Conway 1915. S/7306 L/Cpl. Robert SIM, 10th Bn. Argyll and Sutherland Highlanders. KIA 27 Jul 1915. Age 22 Years. Son of Thomas and Margaret (m.s. McCREADIE) SIM, 23 Garven Terrace, Stevenston. Commemorated Panel 42, Le Touret Memorial, Pas de Calais, France. No known grave. Aaaaaw, now I've got more folk to research - thank you. Edit- their son James married to Elizabeth Oliver. Your part of the World.